Insulin-like growth factor 2 (IGF2) plays an important role in the development of the foetus and in post-natal growth and development. A SNP within intron 3 of porcine IGF2 disrupts a binding site for the repressor, zinc finger BED-type containing 6 (ZBED6), leading to up-regulation of IGF2 in skeletal muscle and major effects on muscle growth, heart size, and fat deposition. This favourable mutation is common in Western commercial pig populations, but is not present in most indigenous Chinese pig breeds. Here, we described the efficient disruption of the ZBED6 binding site motif in intron 3 of IGF2 by CRISPR/Cas9 in porcine embryonic fibroblasts (PEFs) from the indigenous Chinese pig breed, Liang Guang Small Spotted pig. Disruption of the binding motif led to a drastic up-regulation of IGF2 expression in PEFs and enhanced myogenic potential and cell proliferation of PEFs. IGF2-edited pigs were then generated using somatic cell nuclear transfer. Enhanced muscle development was evident in one pig with biallelic deletion of the ZBED6 binding site motif, implying that the release of ZBED6 repression has a major effect on porcine muscle development. 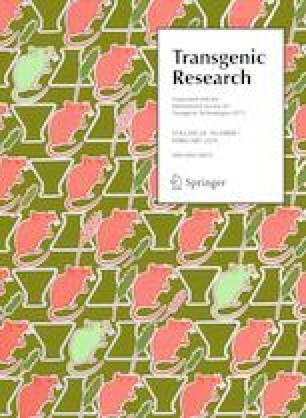 Our study confirmed the important effect of a mutation in the ZBED6 binding site motif on IGF2 expression and myogenesis, thus providing the basis for breeding a new line of Liang Guang Small Spotted pigs with improved lean meat percentage, a trait of great commercial value to pig producers. Xiaofeng Liu and Hongbo Liu these authors have contribute equally to this work. The online version of this article ( https://doi.org/10.1007/s11248-018-0107-9) contains supplementary material, which is available to authorized users. This work was jointly supported by National Transgenic Major Program (2016ZX08006003-006), the Natural Science Foundation of Guangdong Province (2016A030313310 and 2014030312011) and the Program for Guangdong YangFan Introducting Innovative and Enterpreneurial Teams (2014YT02H042).